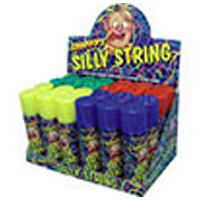 Buy fantastic coloured hairspray and silly string from Novelties Direct at low wholesale prices. Hairsprays are always good fun for both adults and children and create a great effect. We stock a large range of colours which can be sprayed on their own or as mix of colours. They are very popular worn to sporting events such as football in the team colours, as accessories to fancy dress costumes maybe green or orange for halloween. Children particularly love the hairsprays for non school uniform days at school. Enjoy squirting your friends with silly string and have great fun at any party.